I always love that switch in seasons where you no longer reach for an ice cold drink but instead want to wrap your hands around something warm. The start of football season for us is always late August which means the weather is still hot. By late September or early October, there is a slight chill in the air and all our tailgating musts change. The same goes for outdoor parties. 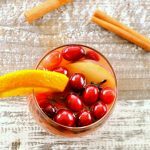 It on those cool days and evenings that I reach for a glass of this cranberry apple bourbon punch. 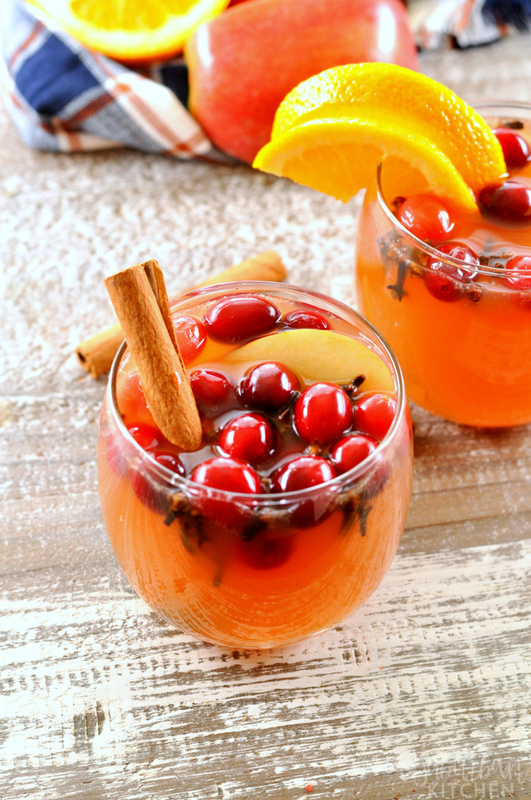 This cranberry apple bourbon punch is about as party perfect of a drink as you can find. 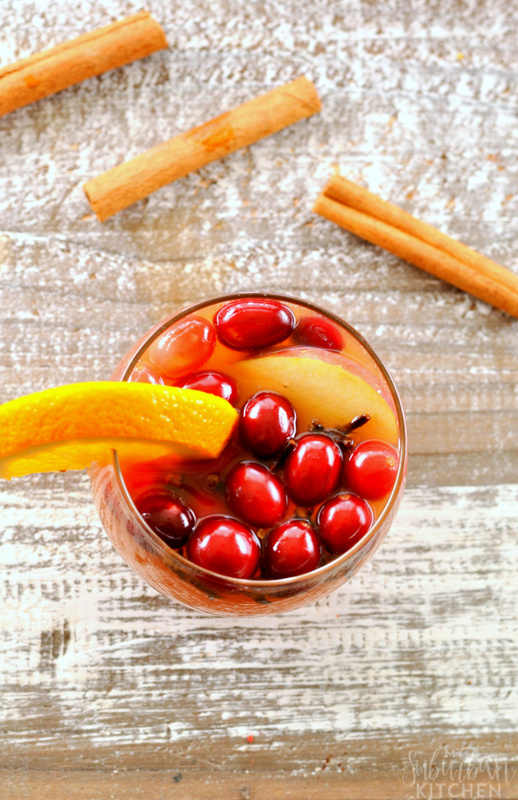 You simply toss all of the ingredients in the slow cooker and, when it is time to party, your warm, fall cocktail is all ready to go. No mixing individual drinks or worrying about ice or any of that. Just set a ladle next to the slow cooker with glasses and you are good to go. I didn’t use a cheesecloth for my spices but you definitely can to make it easier since not everyone wants to sip on whole cloves. 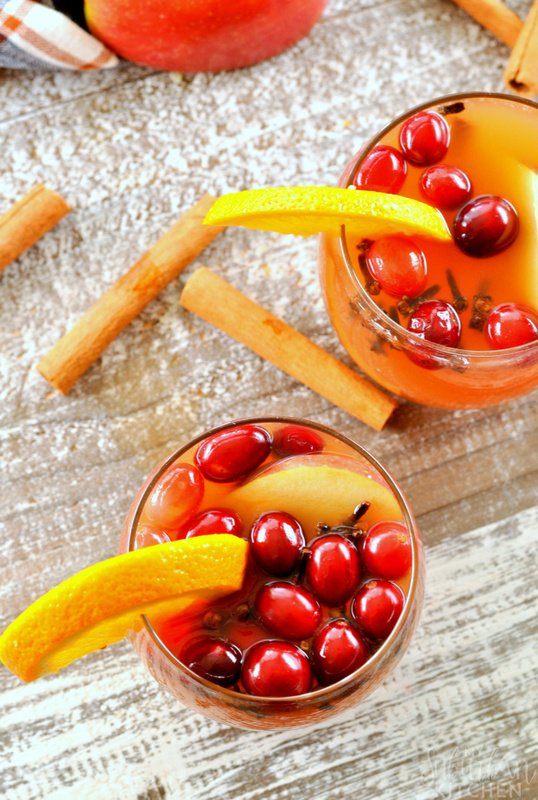 Just be sure to have extra cinnamon sticks for garnishing the drink though. 1. Combine cinnamon sticks, cloves, allspice, apple cider, water, sugar, ginger liquer, orange juice, and bourbon in bowl of slow cooker (Optional: First, tie cinnamon sticks, cloves and allspice in cheesecloth). 2. Simmer on low for 2-3 hours. Add cranberries and simmer at least 30 additional minutes. 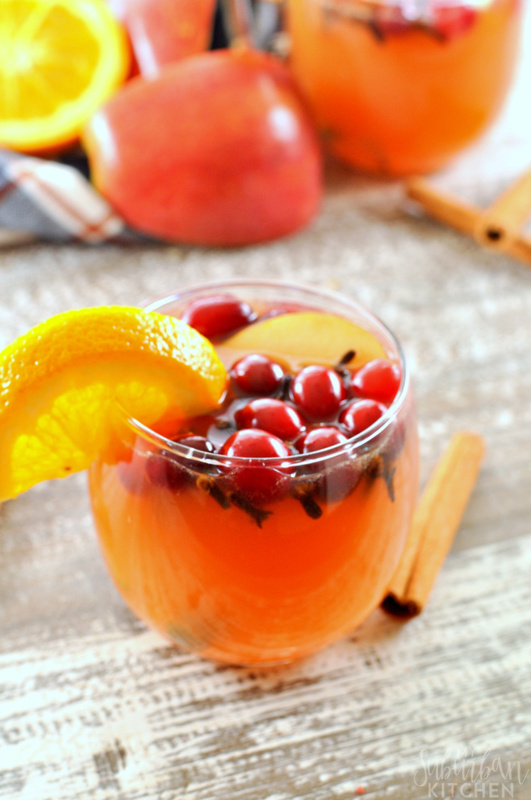 Spoon into mugs and garnish with orange slices. Note: You can also do this on the stovetop. Just bring to a boil and then reduce the heat and simmer for 15-20 minutes. Ginger liquer is something totally new to me but, once I tried it, I knew it had to be a part of this drink. It adds just a little extra flavor to this that is amazing. If you can’t find it, you can substitute grated ginger and then just increase the amount of bourbon or replace it with vodka. We are having friends over to watch our Hokies play on Saturday night and I can’t wait to make this. I know it is going to be a big hit and I love that I can just fix it and forget about it. - You can also do this on the stovetop. Just bring to a boil and then reduce the heat and simmer for 15-20 minutes. - If you can't find ginger liquer, replace with 2 tsp grated ginger and 1/2 cup vodka.